Plan: 3. 3. 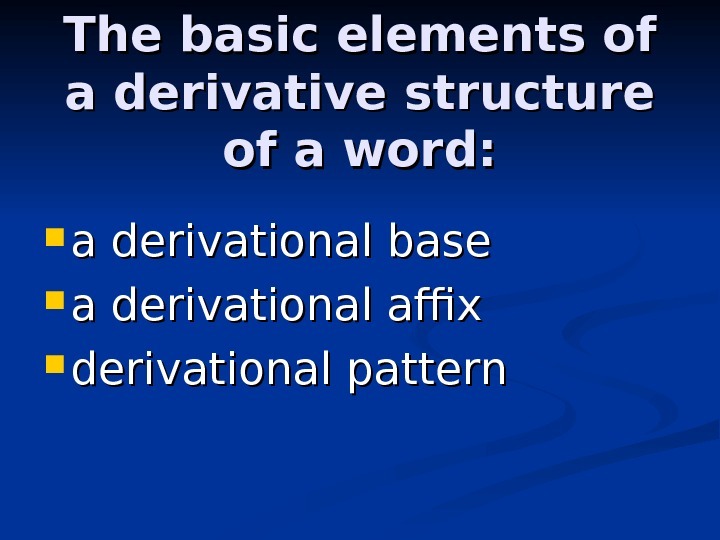 Derivative structure. 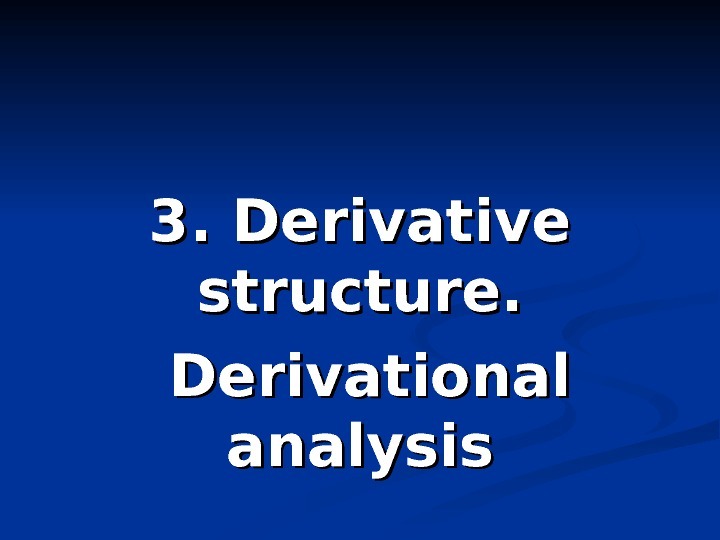 Derivational analysis. 4. 4. 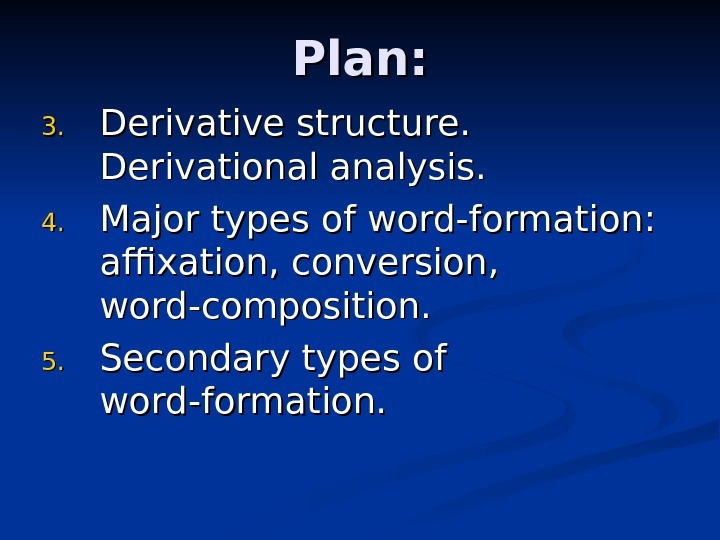 Major types of word-formation: affixation, conversion, word-composition. 5. 5. 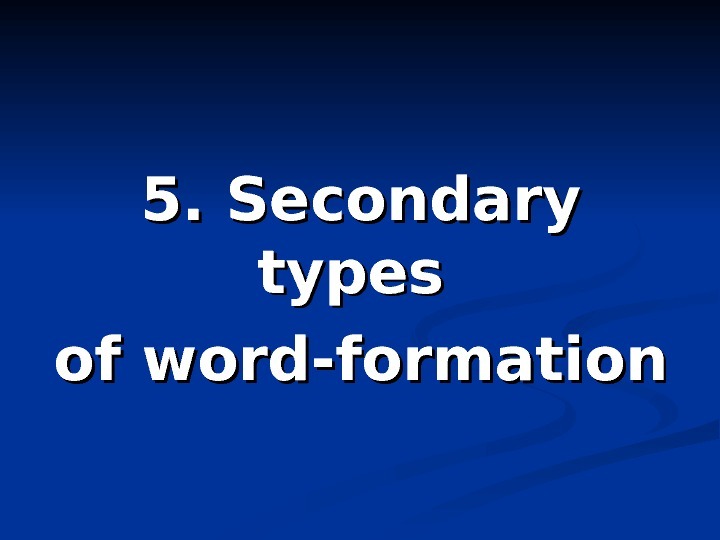 Secondary types of word-formation. 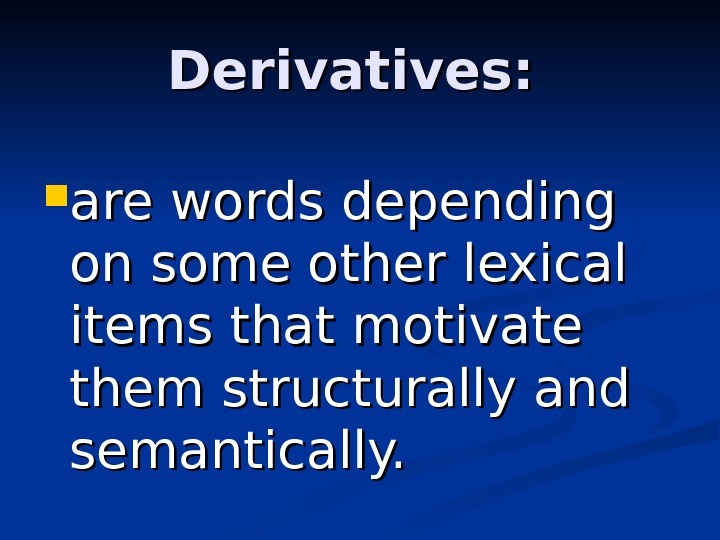 Derivatives: are words depending on some other lexical items that motivate them structurally and semantically. 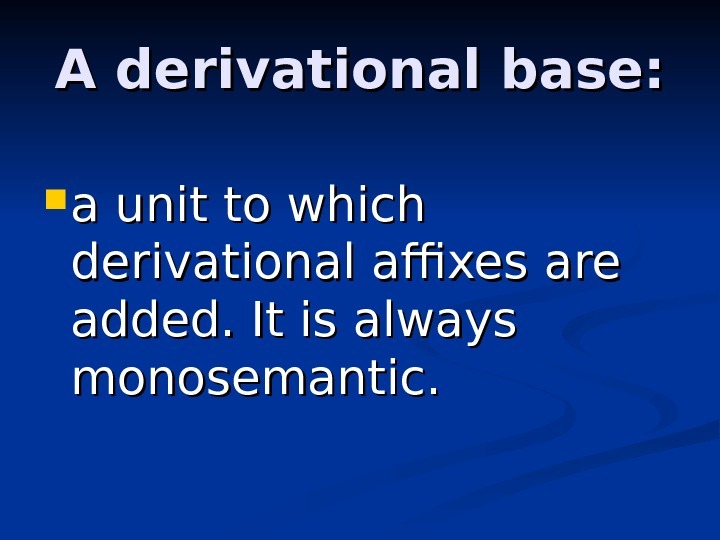 A derivational base: a unit to which derivational affixes are added. 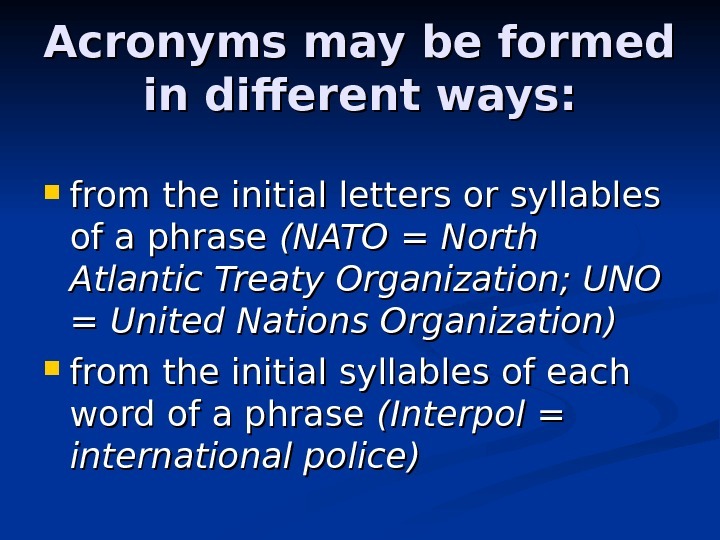 It is always monosemantic. 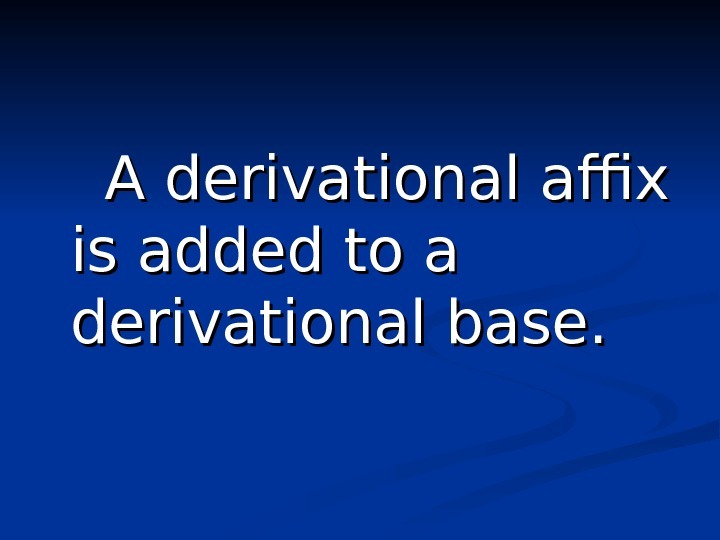 A derivational affix is added to a derivational base. 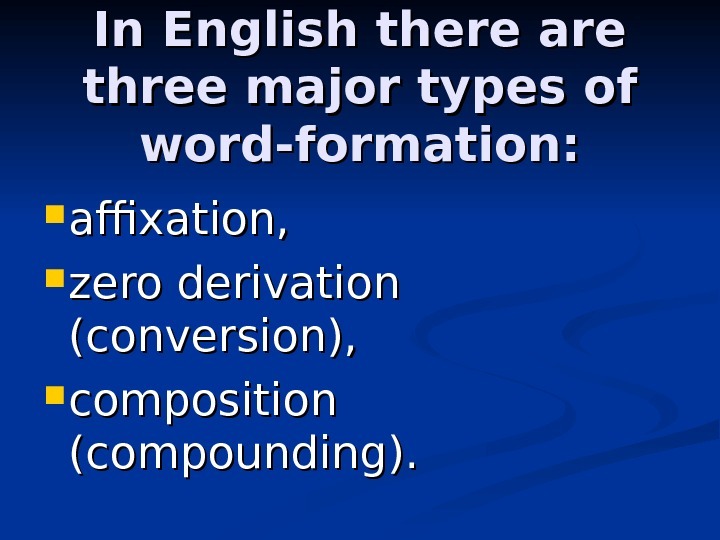 In English there are three major types of word-formation: affixation, zero derivation (conversion), composition (compounding). 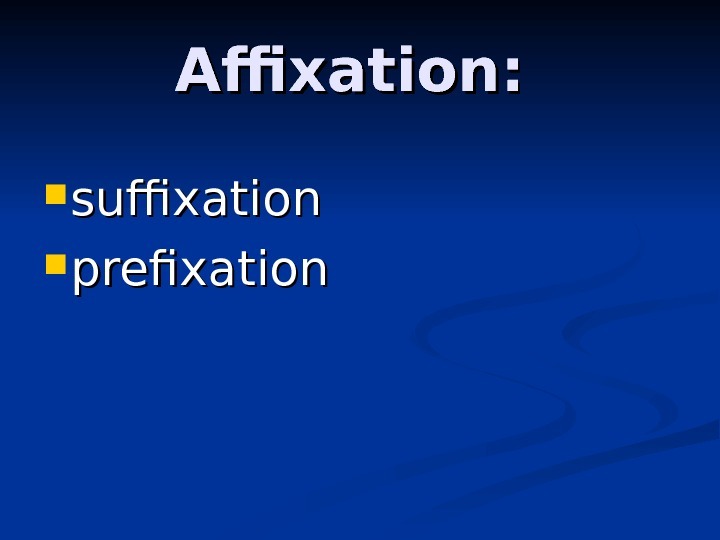 Affixation. 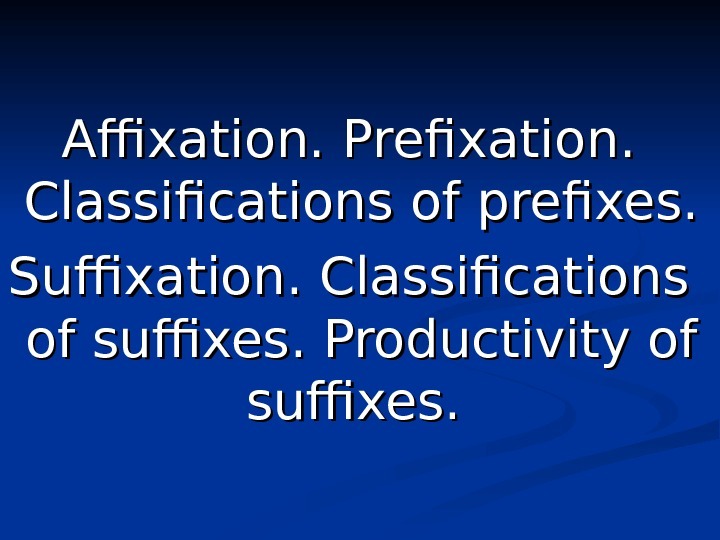 Prefixation. . Classifications of prefixes. 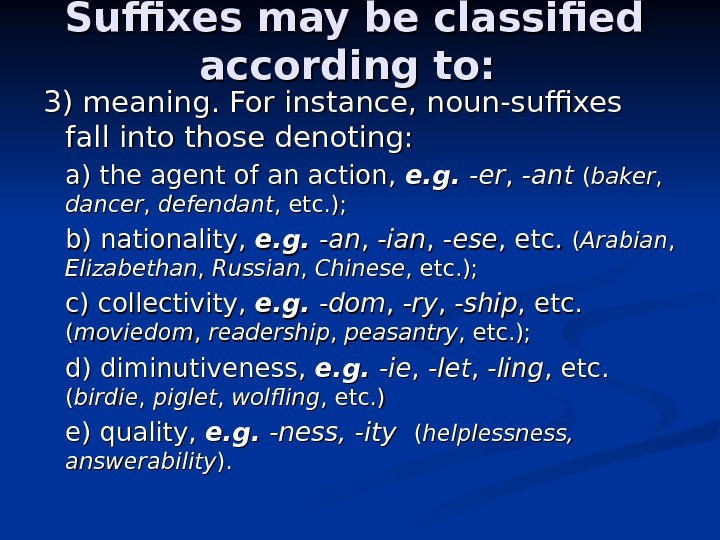 Suffixation. . Classifications of suffixes. . 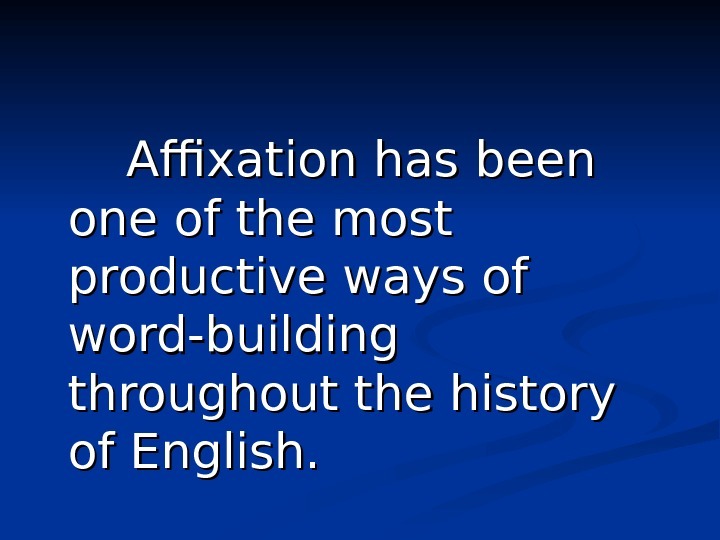 Productivity of suffixes. .
Affixation has been one of the most productive ways of word-building throughout the history of English. 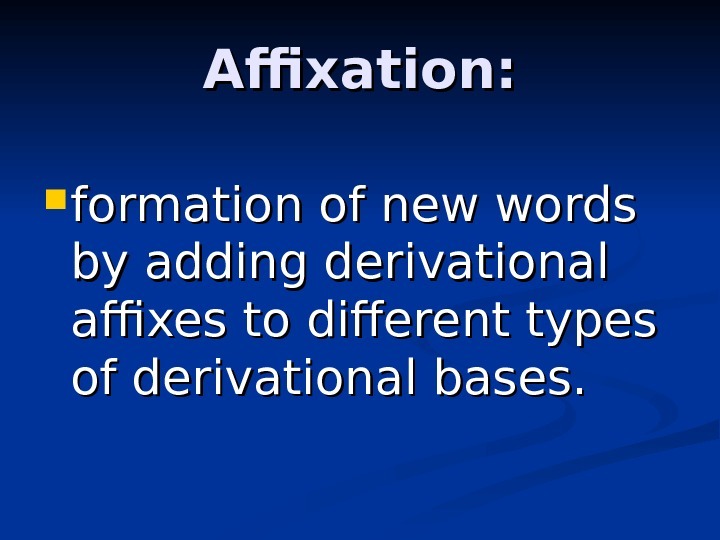 Affixation: formation of new words by adding derivational affixes to different types of derivational bases. 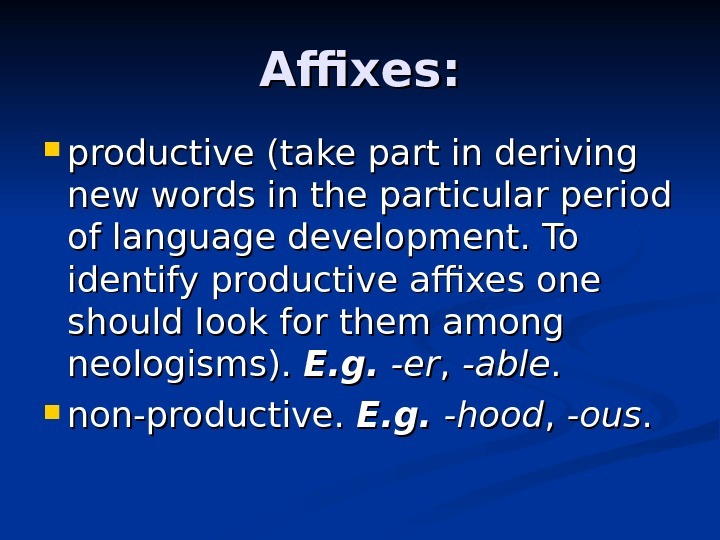 Affixes: productive ( ( take part in deriving new words in the particular period of language development. 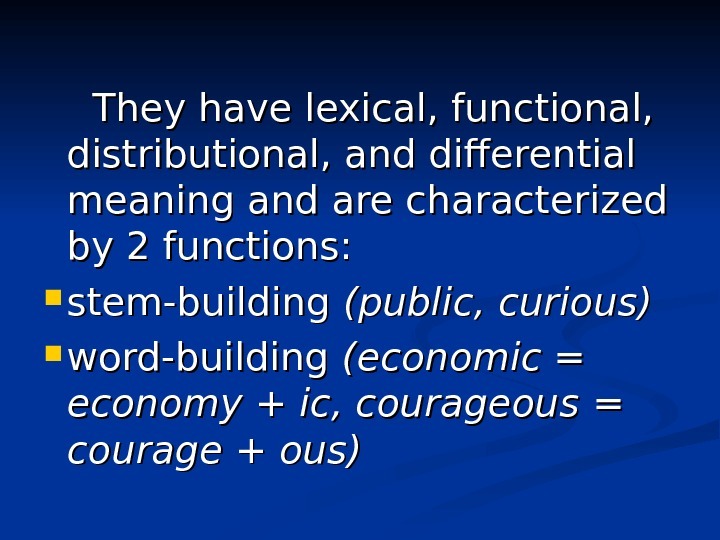 To identify productive affixes one should look for them among neologisms). E. g. -er-er , , -able. . non-productive. E. g. -hood , , -ous. . 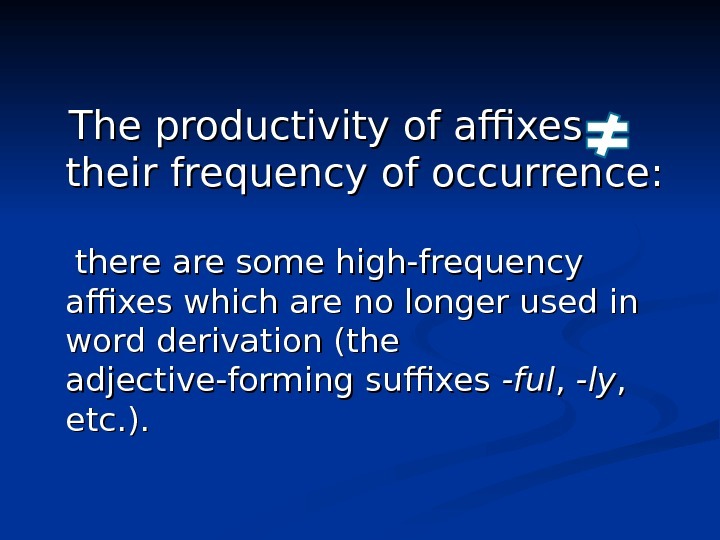 The productivity of affixes their frequency of occurrence: there are some high-frequency affixes which are no longer used in word derivation (the adjective-forming suffixes -ful , , -ly , , etc. ). 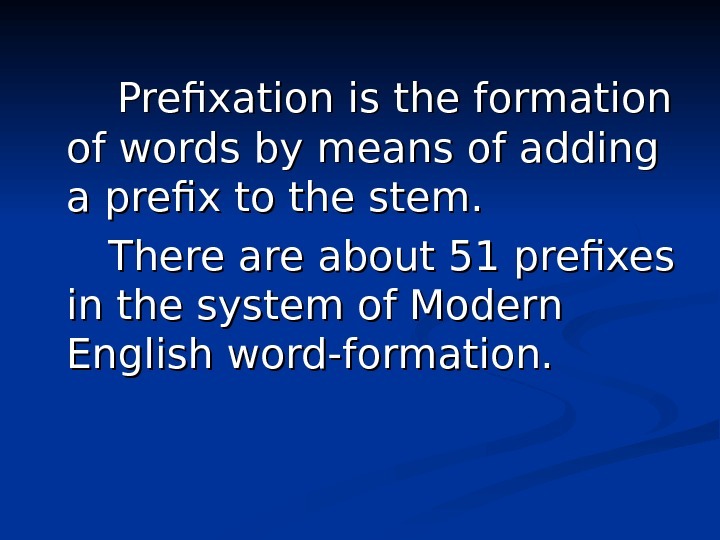 Prefixation is the formation of words by means of adding a prefix to the stem. 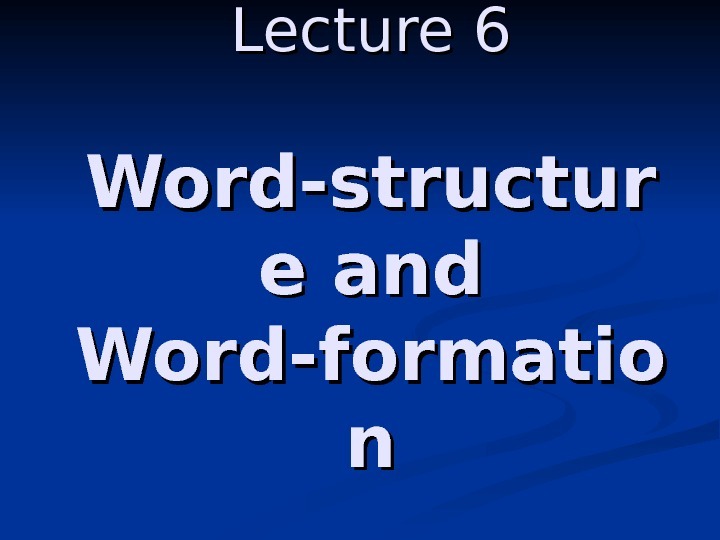 There are about 51 prefixes in the system of Modern English word-formation. 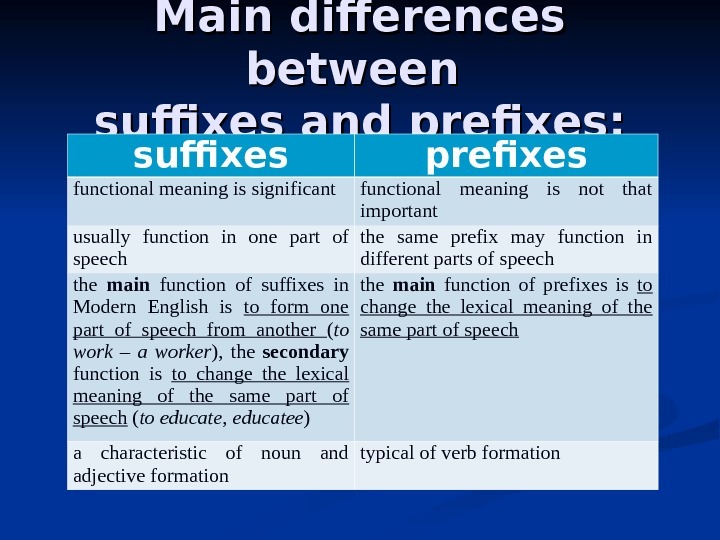 The main function of prefixes: to change the lexical meaning of the same part of speech. 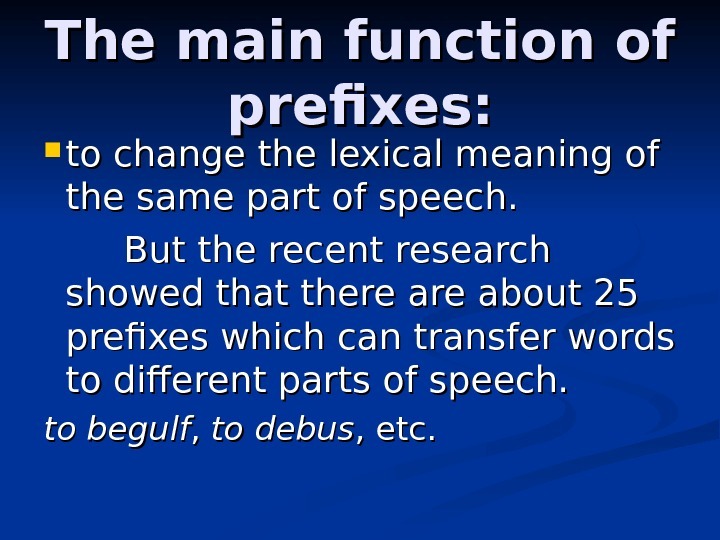 But the recent research showed that there are about 25 prefixes which can transfer words to different parts of speech. to begulf , , to debus , etc. 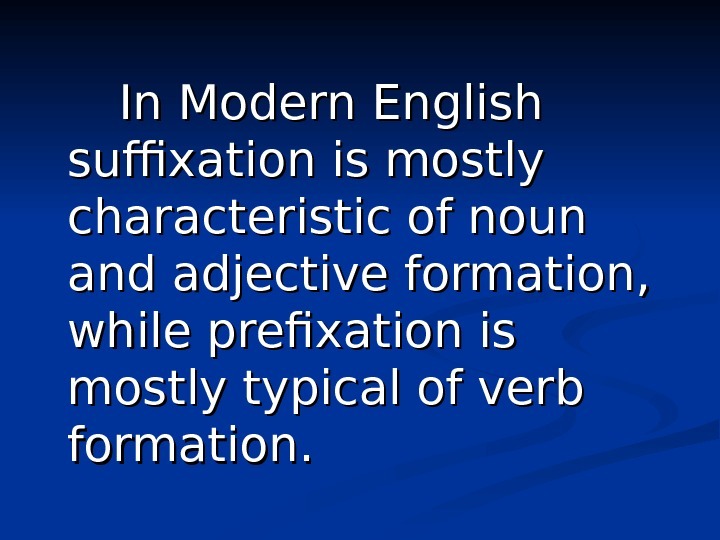 In Modern English suffixation is mostly characteristic of noun and adjective formation, while prefixation is mostly typical of verb formation. 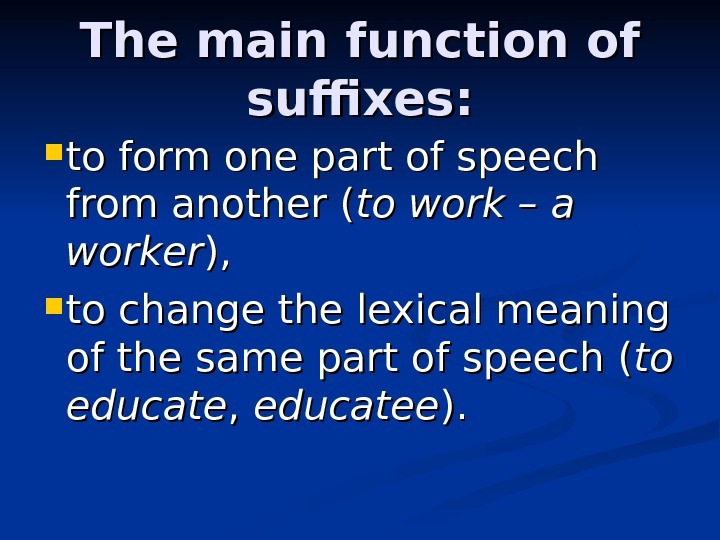 The main function of suffixes: to form one part of speech from another ( to work – a worker ), ), to change the lexical meaning of the same part of speech ( to to educate , , educatee ). ). 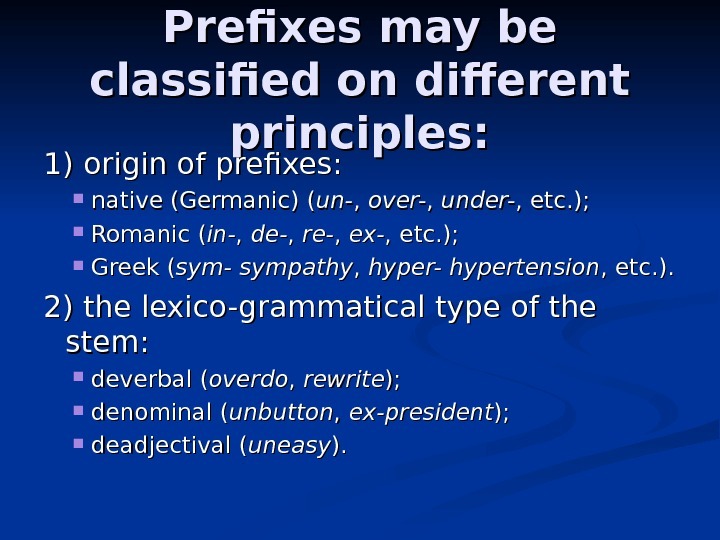 Prefixes may be classified on different principles: 1) origin of prefixes: native (Germanic) ( un-un- , , over- , , under- , etc. ); Romanic ( in-in- , , de- , , re- , , ex- , etc. ); Greek ( sym- sympathy , , hyper- hypertension , etc. ). 2) the lexico-grammatical type of the stem: deverbal ( overdo , , rewrite ); ); denominal ( unbutton , , ex-president ); ); deadjectival ( uneasy ). ). 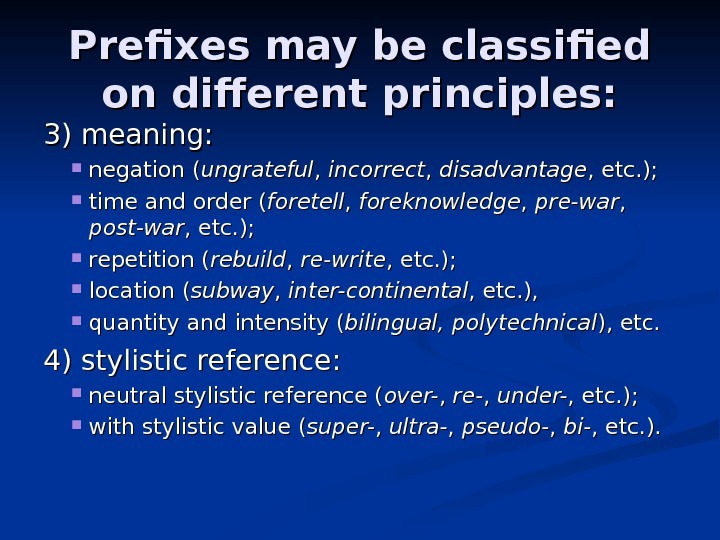 Prefixes may be classified on different principles: 3) meaning: negation ( ungrateful , , incorrect , , disadvantage , etc. ); time and order ( foretell , , foreknowledge , , pre-war , , post-war , etc. ); repetition ( rebuild , , re-write , etc. ); location ( subway , , inter-continental , etc. 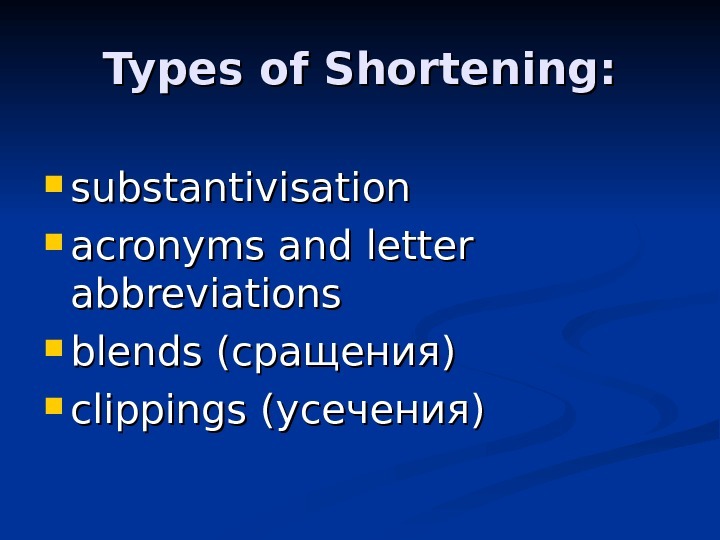 ), quantity and intensity ( bilingual, polytechnical ), etc. 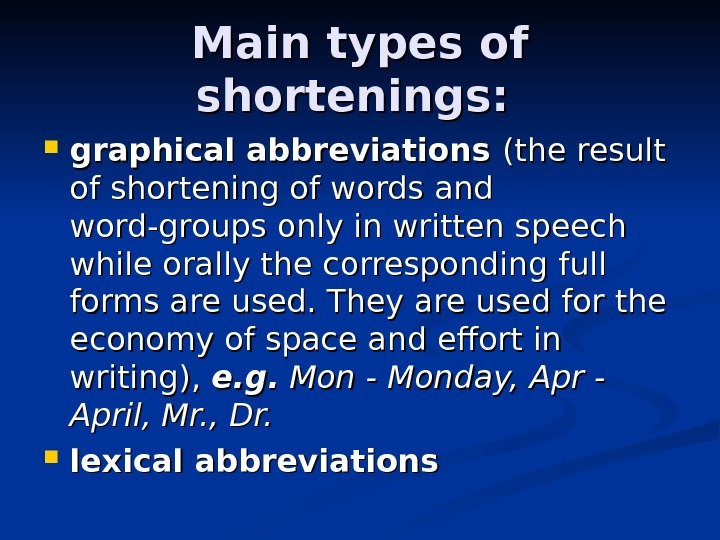 4) stylistic reference: neutral stylistic reference ( over- , , re- , , under- , etc. ); with stylistic value ( super- , , ultra- , , pseudo- , , bi- , etc. ). 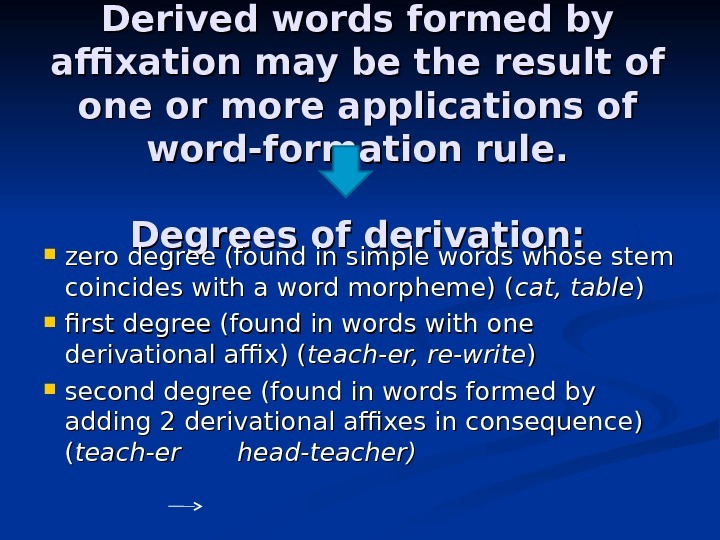 Disputable cases: words with a disputable structure, such as as contain, retain, detain and conceive, receive, deceive, where we can see that re-, de-, con- act as prefixes and -tain, -ceive can be understood as roots. 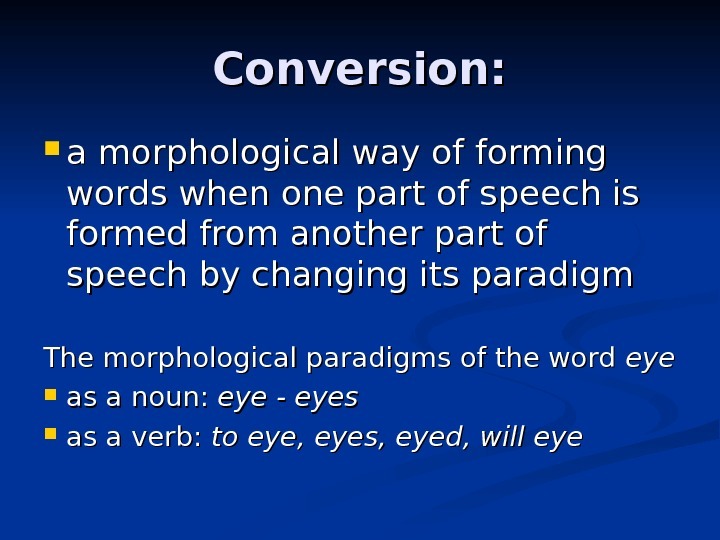 But in English these combinations of sounds have no lexical meaning and are called pseudo-morphemes. Some scientists treat such words as simple words, others as derived ones. 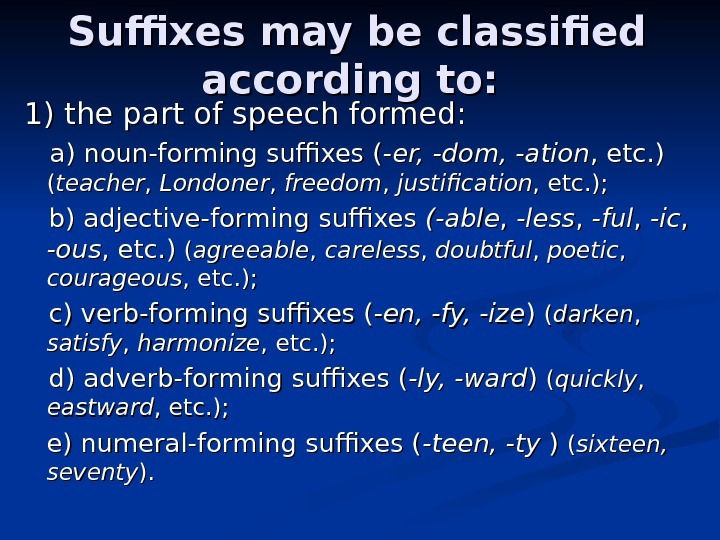 Suffixes may be classified according to: 1) the part of speech formed: a) a) noun-forming suffixes ( ( -er, -dom, -ation , etc. ) (( teacher , , Londoner , , freedom , , justification , etc. ); b) adjective- forming suffixes (-able , , -less , , -ful , , -ic , , -ous , etc. ) ( ( agreeable , , careless , , doubtful , , poetic , , courageous , etc. 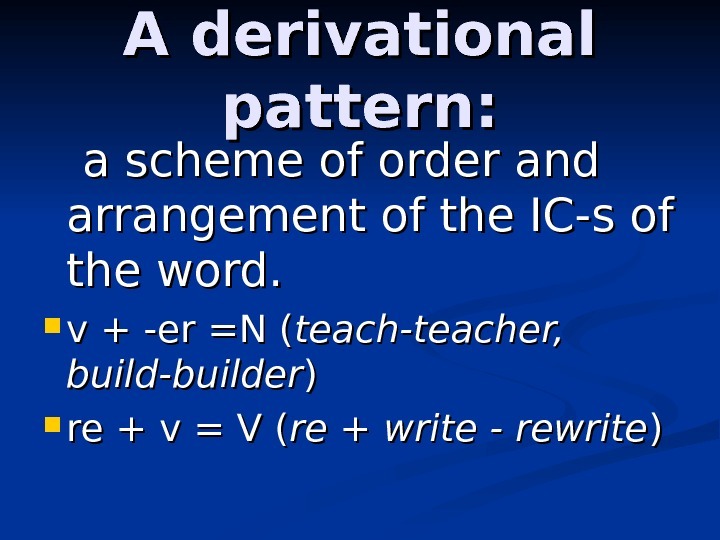 ); c) verb -forming suffixes ( -en, -fy, -ize ) ) (( darken , , satisfy , , harmonize , etc. ); d) adverb -forming suffixes ( -ly, -ward ) ) (( quickly , , eastward , etc. ); e) numeral-forming suffixes ( -teen, -ty ) ) (( sixteen, seventy )). .
Suffixes may be classified according to: 2) lexico-grammatical character of the base the affix is usually added to: deverbal (those added to the verbal base), e. g. -er-er , , -ing , , -ment , , -able , etc. (( speaker , , reading , , agreement , , suitable , etc. 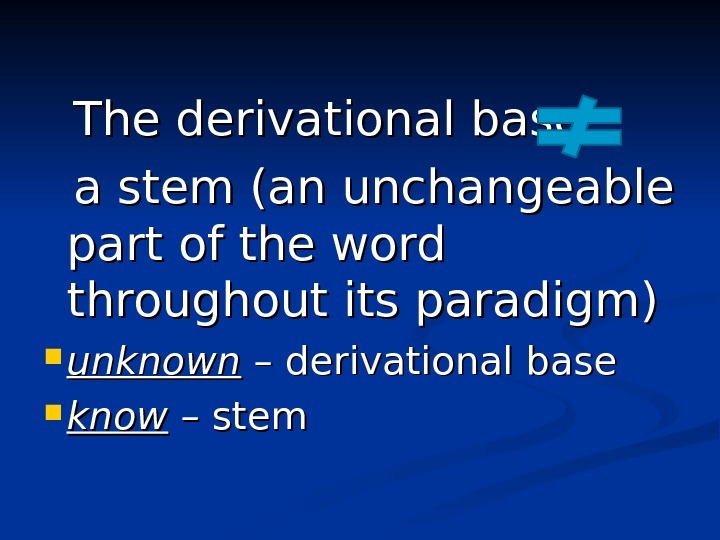 ); denominal (those added to the noun base), e. g. -less , , -ish , , -ful , , -ist , , -some , etc. (( handless, childish, mouthful, violinist, troublesome , etc. ); deadjectival (those affixed to the adjective base), e. g. -en-en , , -ly , , -ish , , -ness , etc. (( blacken , , slowly , , reddish , , brightness , etc. ). 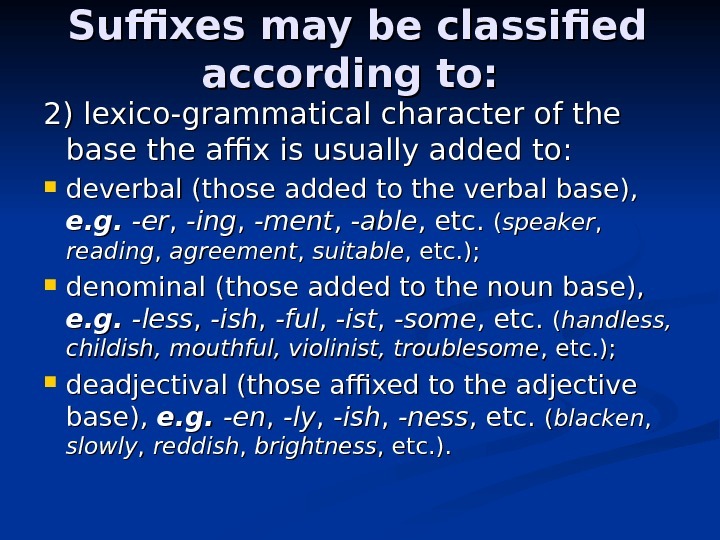 Suffixes may be classified according to: 3) meaning. For instance, noun-suffixes fall into those denoting: a) the agent of an action, e. g. -er-er , , -ant (( baker , , dancer , , defendant , etc. ); b) nationality, e. g. -an-an , , -ian , , -ese , etc. (( Arabian , , Elizabethan , , Russian , , Chinese , etc. ); c) collectivity, e. g. -dom , , -ry , , -ship , etc. (( moviedom , , readership , , peasantry , etc. ); d) diminutiveness, e. g. -ie-ie , , -let , , -ling , etc. (( birdie , , piglet , , wolfling , etc. ) e) quality, e. g. -ness, -ity (( helplessness, answerability ). ). 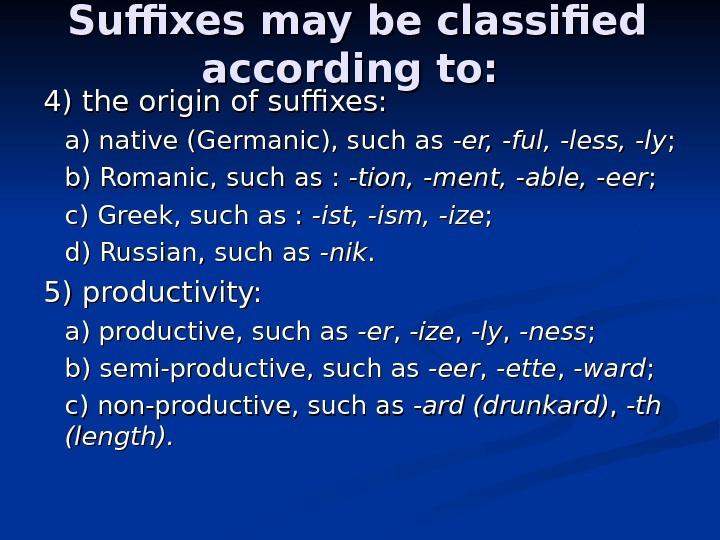 Suffixes may be classified according to: 4) 4) the origin of suffixes: a) native (Germanic), such as -er, -ful, -less, -ly ; ; b) Romanic, such as : -tion, -ment, -able, -eer ; ; c) Greek, such as : -ist, -ism, -ize ; ; d) Russian, such as -nik. . 5) productivity: a) productive, such as -er-er , , -ize , , -ly , , -ness ; ; b) semi-productive, such as -eer , , -ette , , -ward ; ; c) non-productive, such as -ard (drunkard) , , -th (length). 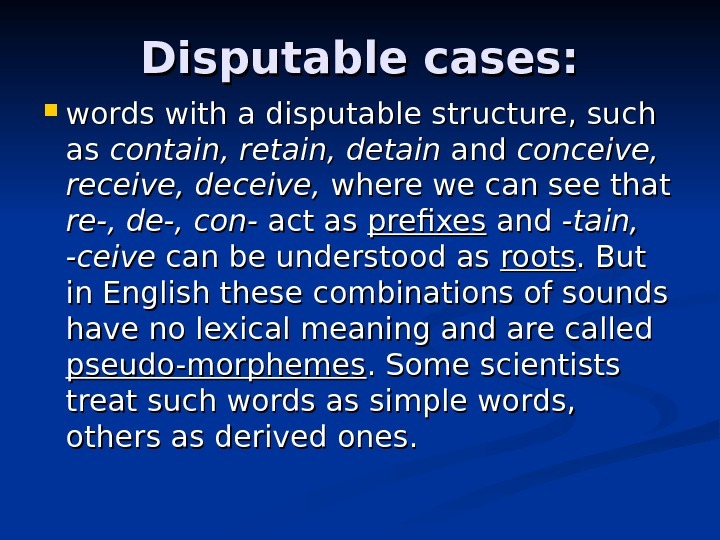 Disputable cases: whether we have a suffix or or a root morphem e in the structure of a word. 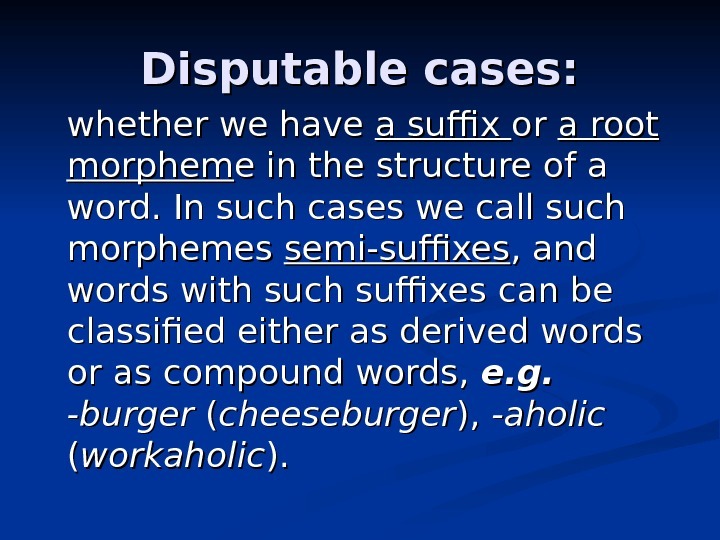 In such cases we call such morphemes semi-suffixes , and words with such suffixes can be classified either as derived words or as compound words, e. g. -burger (( cheeseburger ), ), -aholic (( workaholic ). ). Conversion. 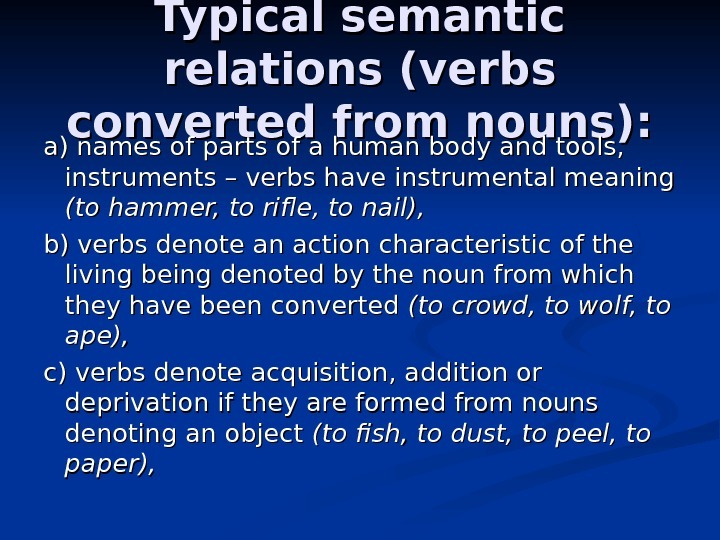 Typical semantic relations. 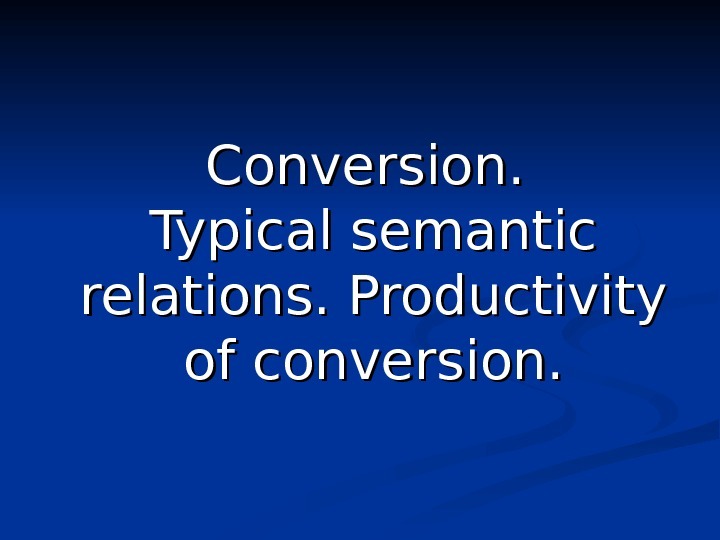 Productivity of conversion. 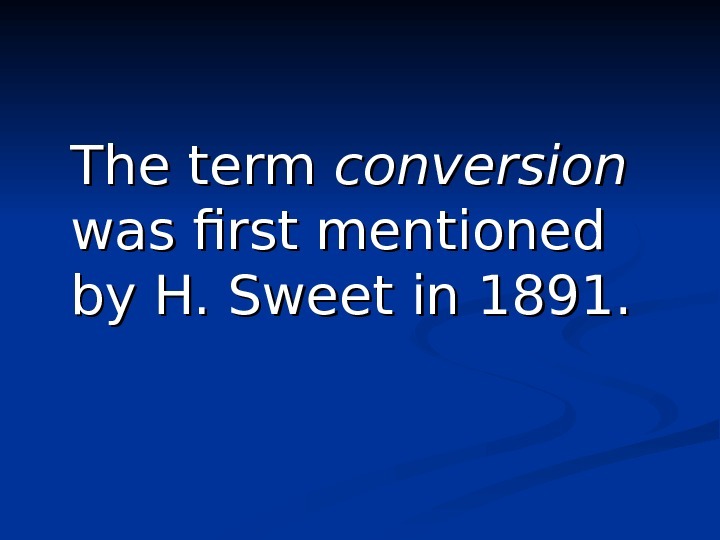 The term conversion was first mentioned by H. Sweet in 1891. 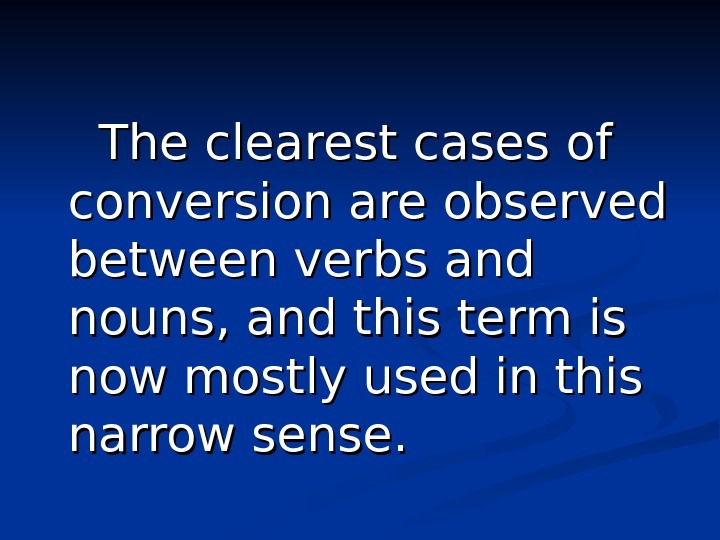 The clearest cases of conversion are observed between verbs and nouns, and this term is now mostly used in this narrow sense. 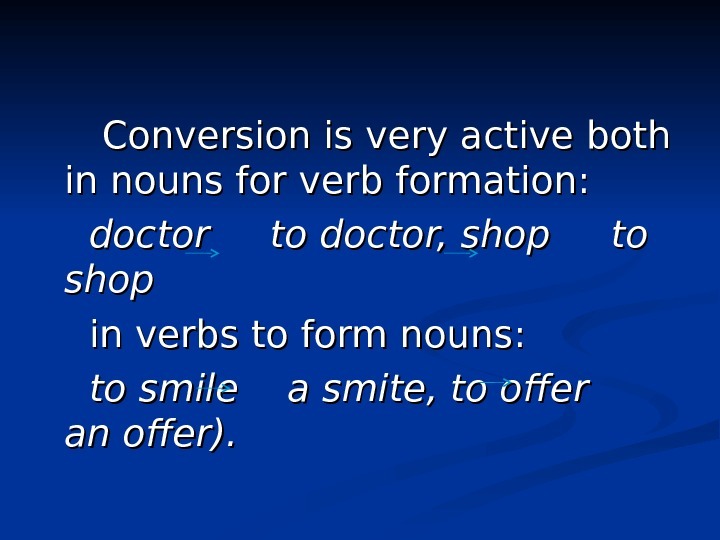 Conversion is very active both in nouns for verb formation: doctor to doctor, shop to shop in verbs to form nouns: to smile a smite, to offer an offer). 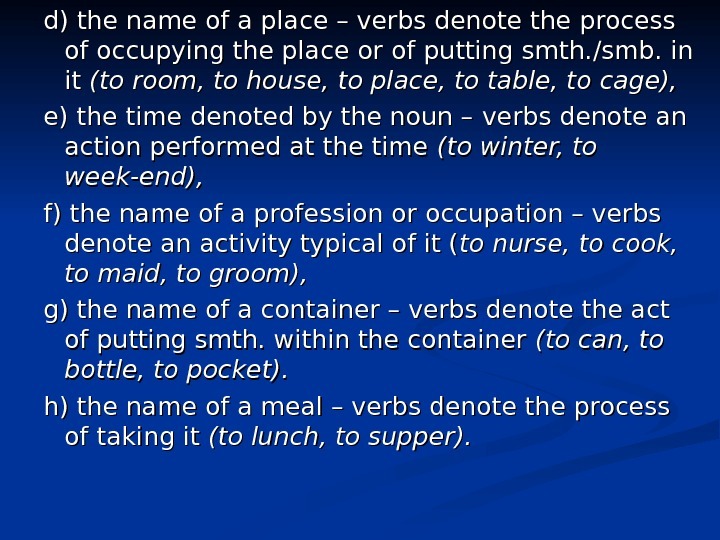 d)d) the name of a place – verbs denote the process of occupying the place or of putting smth. /smb. in it it (to room, to house, to place, to table, to cage), e) the time denoted by the noun – verbs denote an an action performed at the time (to winter, to week-end), f) the name of a profession or occupation – verbs denote an activity typical of it ( to nurse, to cook, to maid, to groom), g) the name of a container – verbs denote the act of putting smth. within the container (to can, to bottle, to pocket). h) the name of a meal – verbs denote the process of taking it (to lunch, to supper). 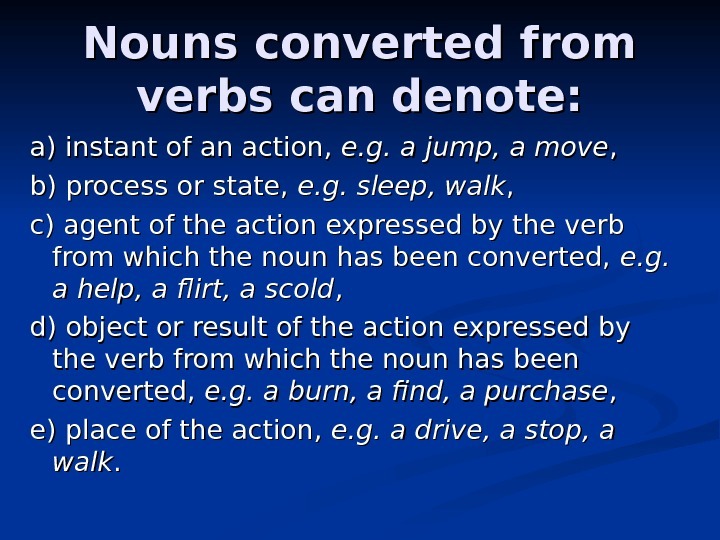 Nouns converted from verbs can denote: a) instant of an action, e. g. a jump, a move , , b) process or state, e. g. sleep, walk , , c) agent of the action expressed by the verb from which the noun has been converted, e. g. a help, a flirt, a scold , , d) object or result of the action expressed by the verb from which the noun has been converted, e. g. a burn, a find, a purchase , , e) place of the action, e. g. a drive, a stop, a walk. . 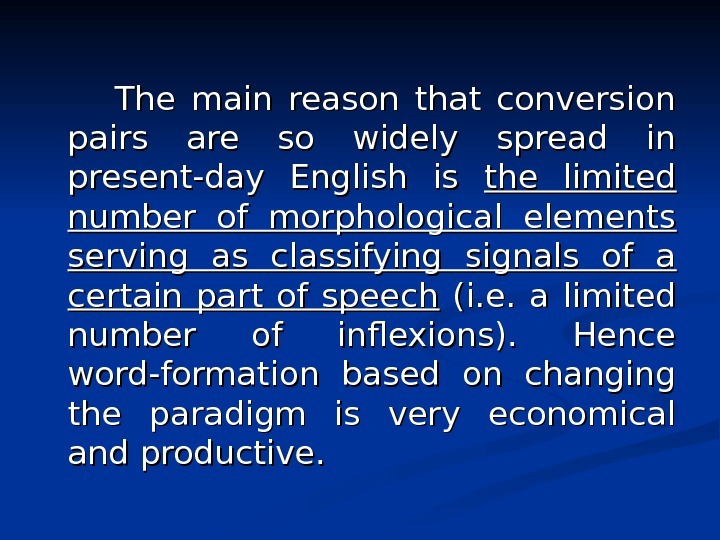 The main reason that conversion pairs are so widely spread in present-day English is the limited number of morphological elements serving as classifying signals of a certain part of speech (i. e. a limited number of inflexions). 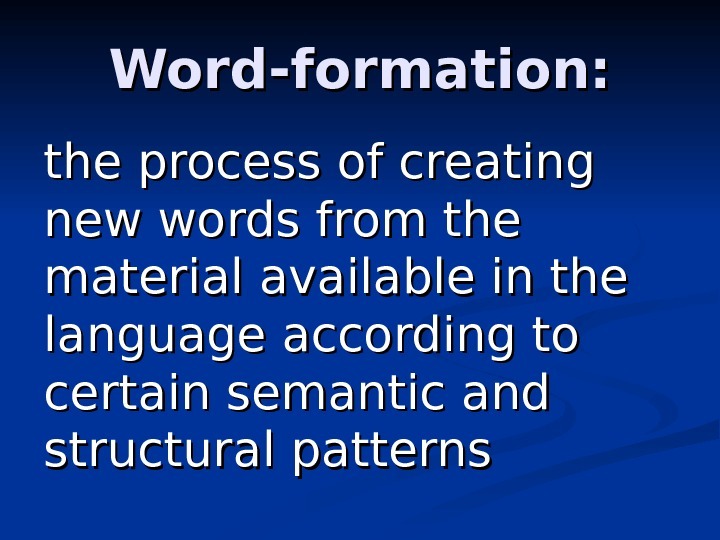 Hence word-formation based on changing the paradigm is very economical and productive. Word-composition. Features of compound-words. 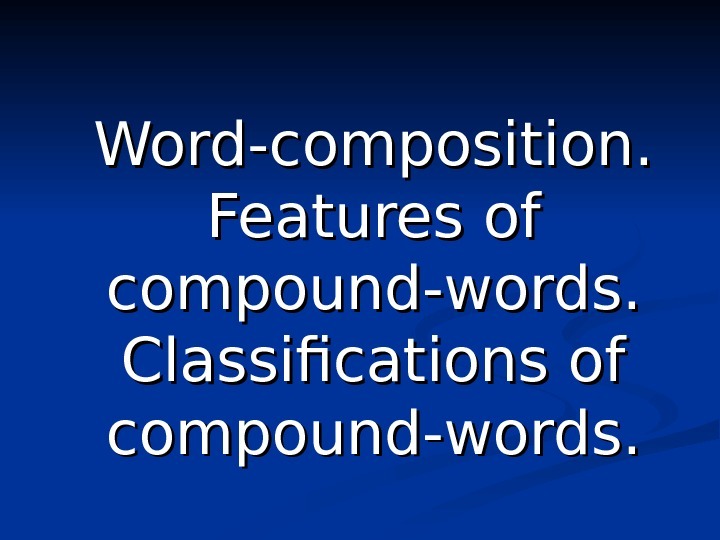 Classifications of compound-words. 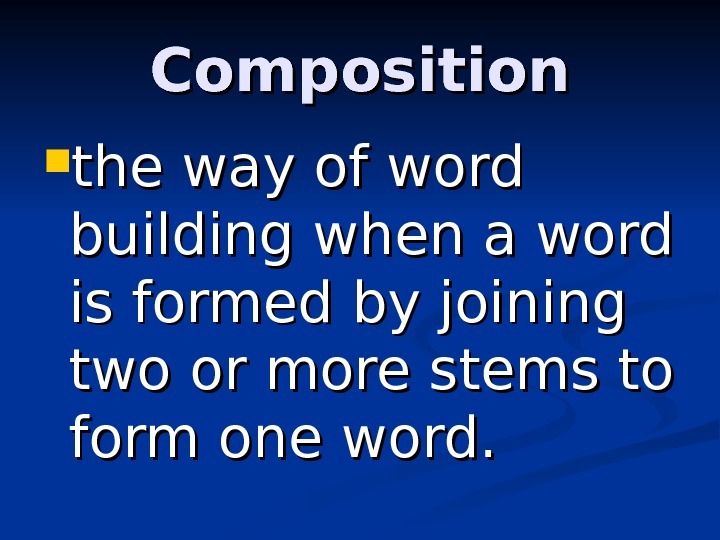 Composition the way of word building when a word is formed by joining two or more stems to form one word. 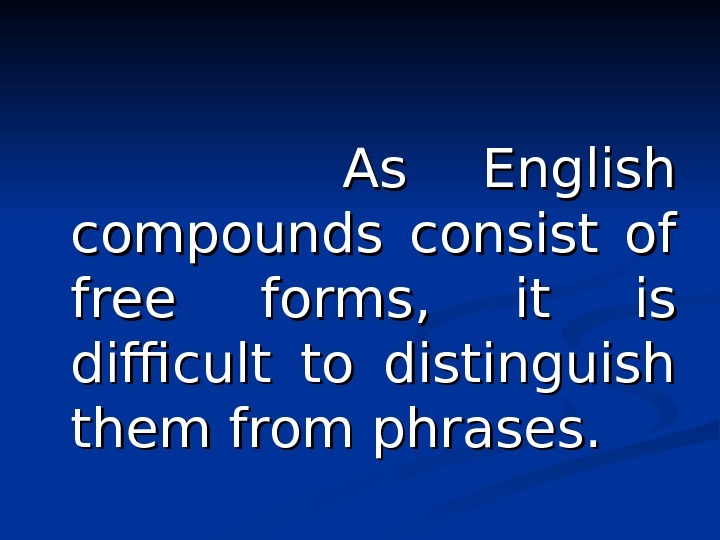 As English compounds consist of free forms, it is difficult to distinguish them from phrases. 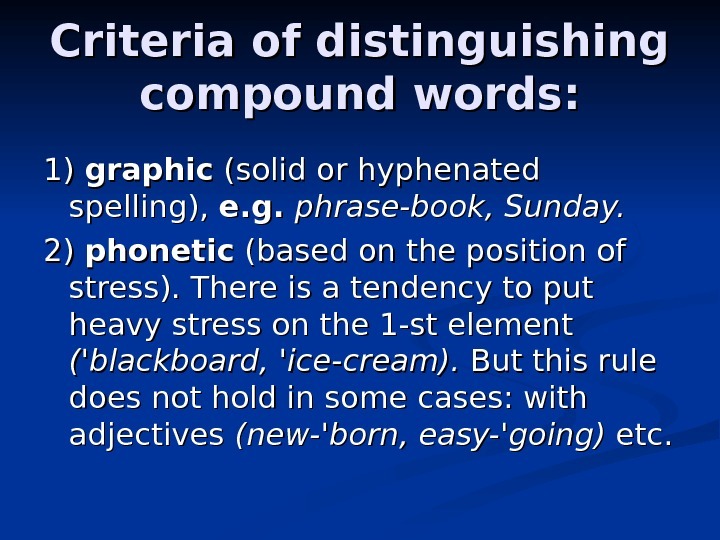 Criteria of distinguishing compound words: 1) 1) graphic (solid or hyphenated spelling), e. g. phrase-book, Sunday. 2) 2) phonetic (based on the position of stress). There is a tendency to put heavy stress on the 1 -st element (( » blackboard, » ice-cream). 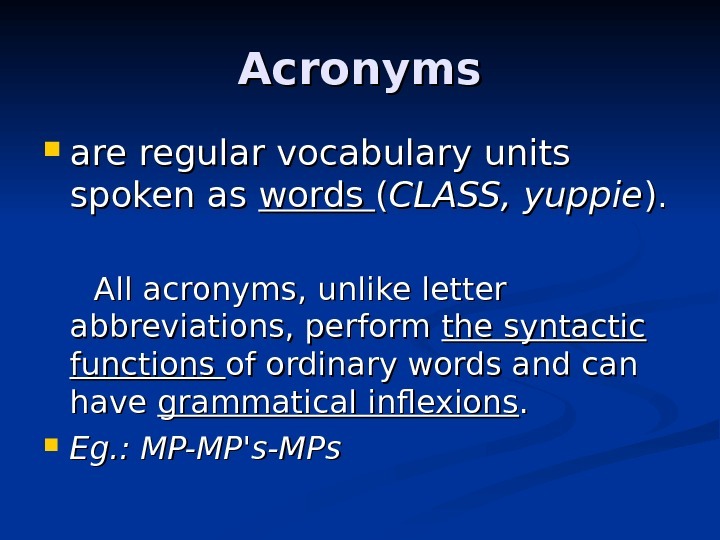 But this rule does not hold in some cases: with adjectives (new- » born, easy- » going) etc. 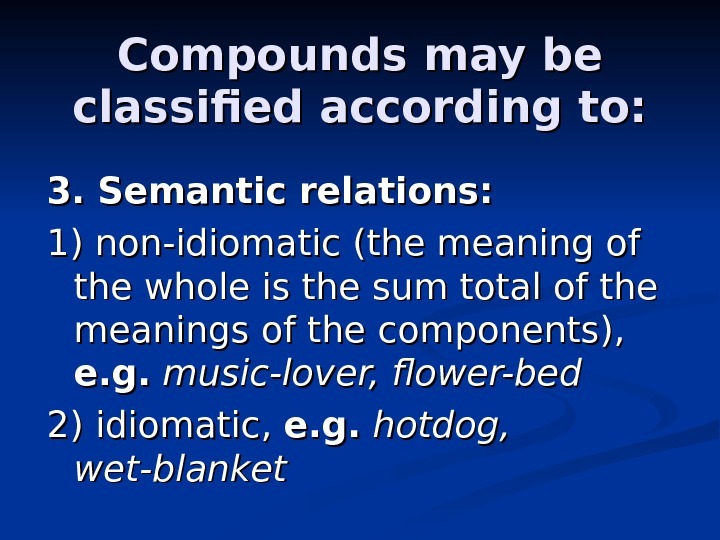 3)3) semantic (a compound is a combination forming a unit that expresses a single idea and that is not identical in meaning to the sum of the meanings of its components in a free phrase). 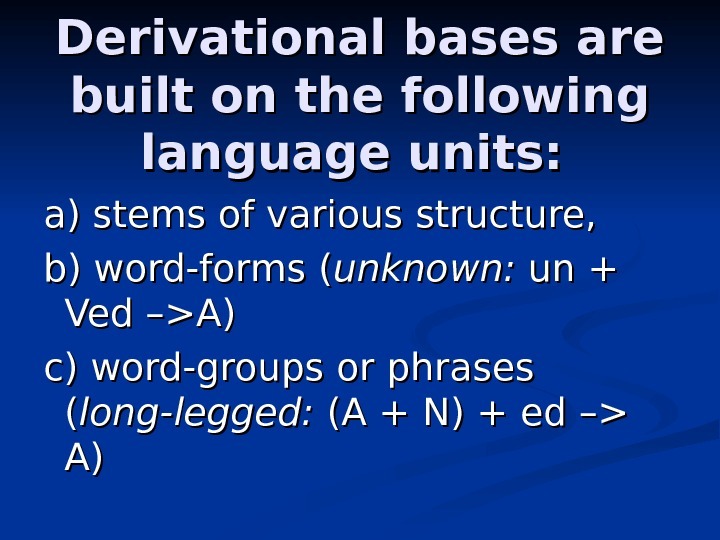 4) 4) the unity of morphological and syntactical functioning. 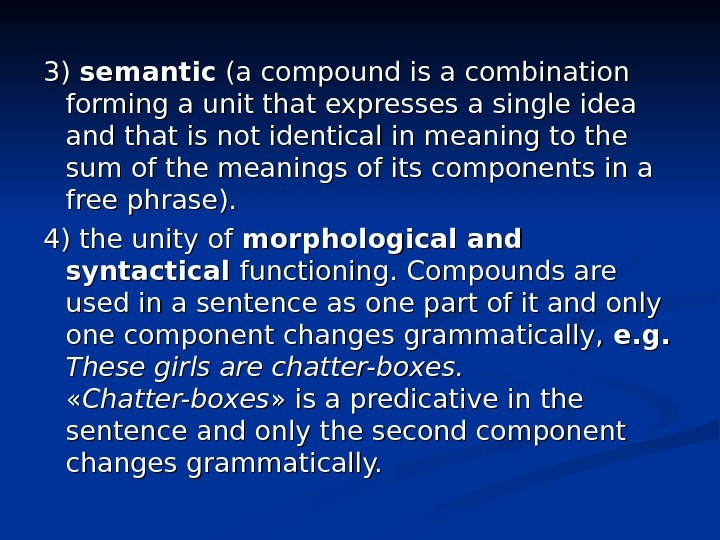 Compounds are used in a sentence as one part of it and only one component changes grammatically, e. g. These girls are chatter-boxes. « « Chatter-boxes » is a predicative in the sentence and only the second component changes grammatically. 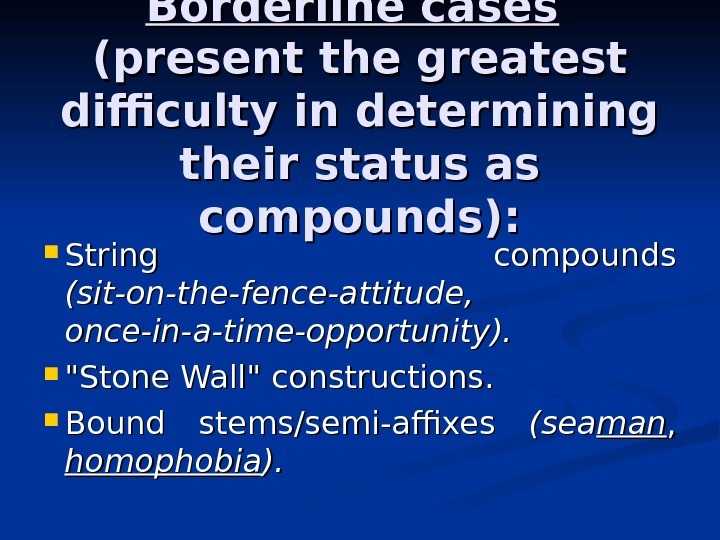 Borderline cases (present the greatest difficulty in determining their status as compounds): String compounds (sit-on-the-fence-attitude, once-in-a-time-opportunity). «Stone Wall» constructions. Bound stems/semi-affixes (sea manman , , homophobia ). ). 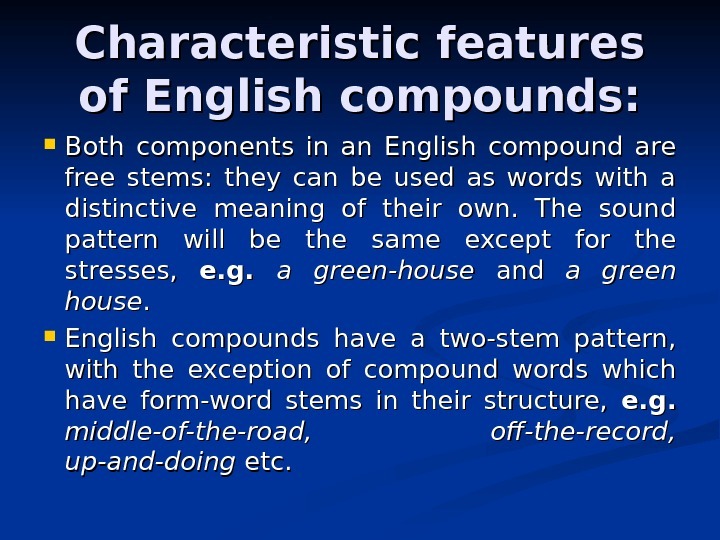 Characteristic features of English compounds: Both components in an English compound are free stems: they can be used as words with a distinctive meaning of their own. The sound pattern will be the same except for the stresses, e. g. a green-house and a green house. . English compounds have a two-stem pattern, with the exception of compound words which have form-word stems in their structure, e. g. middle-of-the-road, off-the-record, up-and-doing etc. Compounds may be classified according to: 1. 1. 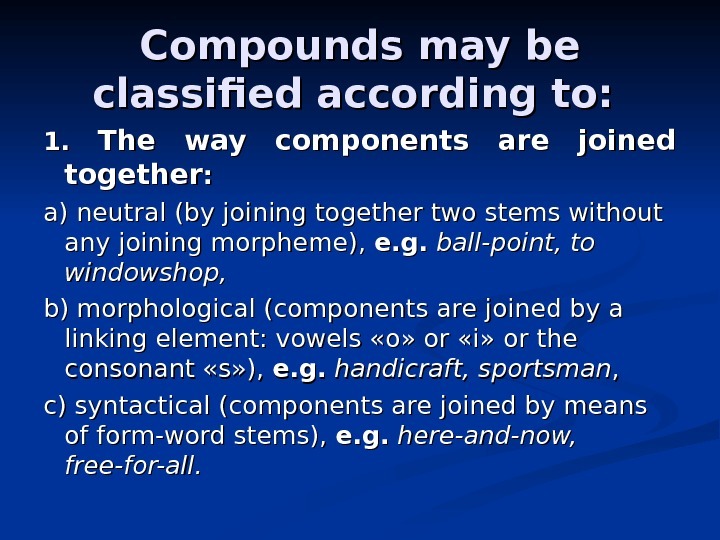 The way components are joined together : : a) neutral (by joining together two stems without any joining morpheme), e. g. ball-point, to windowshop, b) morphological (components are joined by a linking element: vowels «o» or «i» or the consonant «s» ), e. g. handicraft, sportsman , , c) syntactical (components are joined by means of form-word stems), e. g. here-and-now, free-for-all. Compounds may be classified according to: 2. 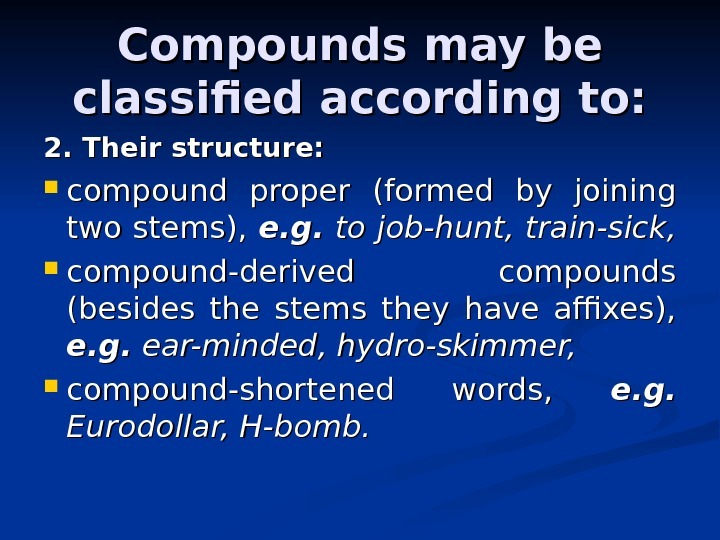 Their structure: compound proper (formed by joining two stems), e. g. to job-hunt, train-sick, compound-derived compounds (besides the stems they have affixes), e. g. ear-minded, hydro-skimmer, compound-shortened words, e. g. Eurodollar, H-bomb. 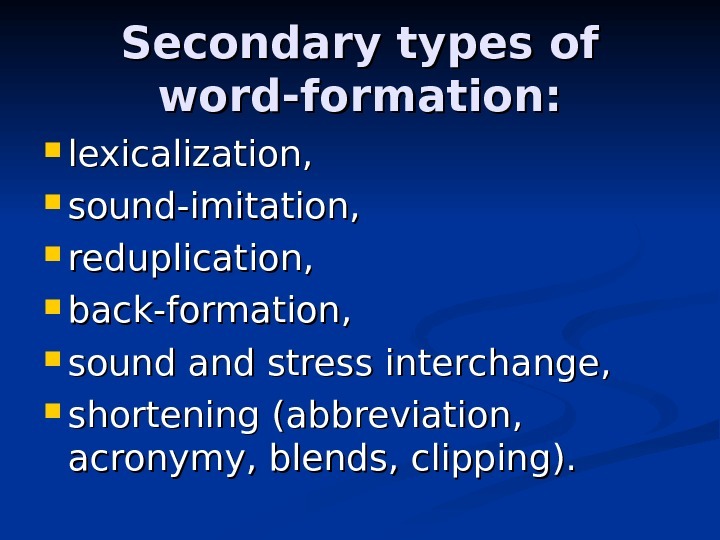 Secondary types of word-formation: lexicalization, sound-imitation, reduplication, back-formation, sound and stress interchange, shortening (abbreviation, acronymy, blends, clipping). 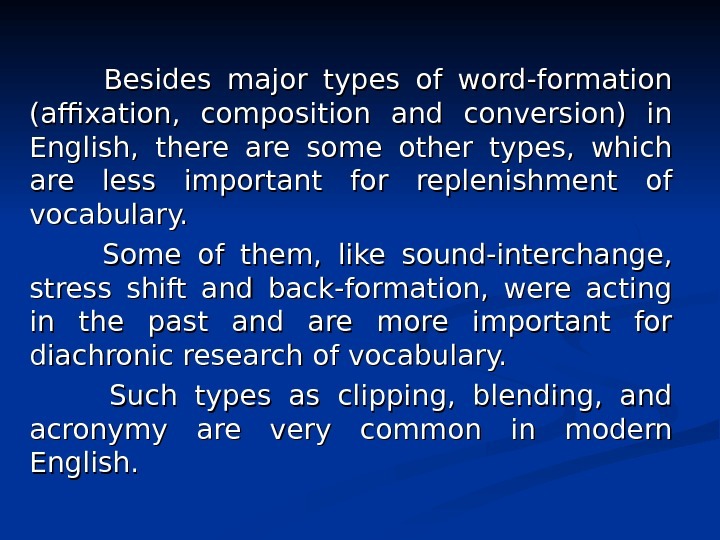 Besides major types of word-formation (affixation, composition and conversion) in English, there are some other types, which are less important for replenishment of vocabulary. 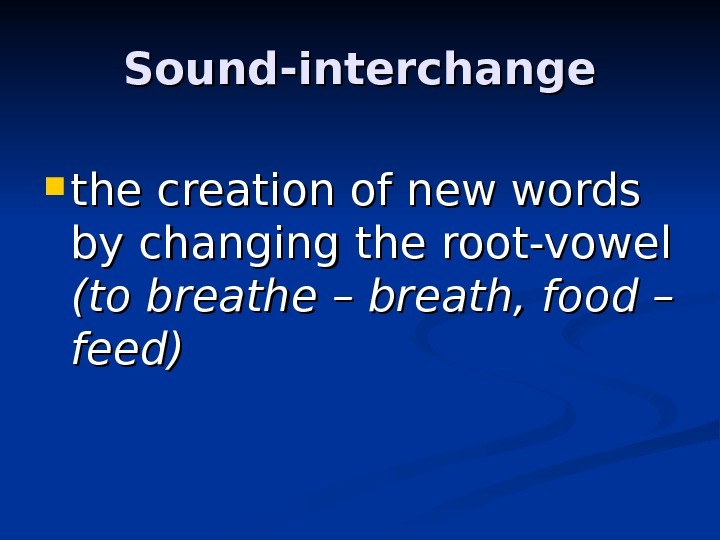 Some of them, like sound-interchange, stress shift and back-formation, were acting in the past and are more important for diachronic research of vocabulary. 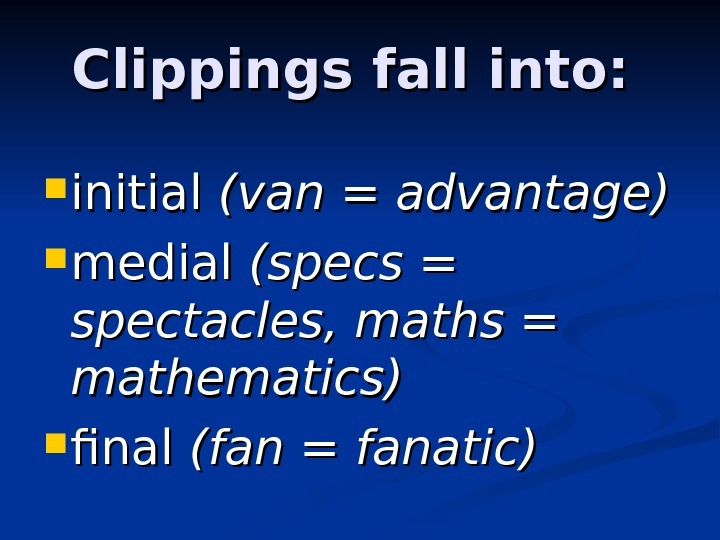 Such types as clipping, blending, and acronymy are very common in modern English. 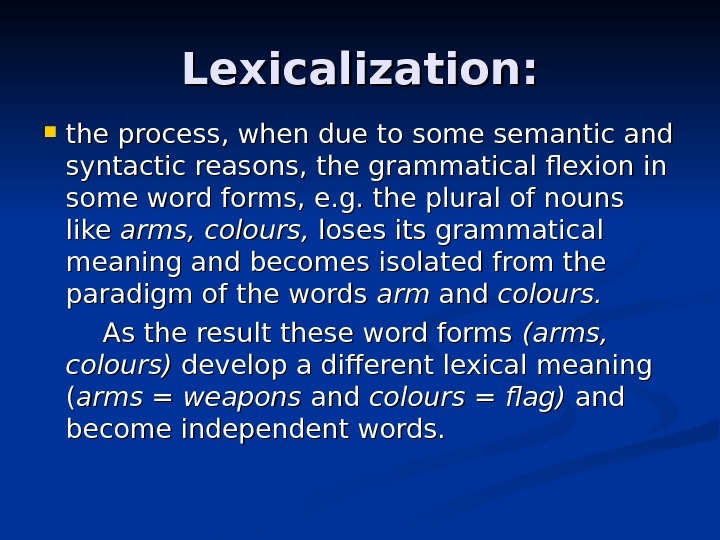 Lexicalization: the process, when due to some semantic and syntactic reasons, the grammatical flexion in some word forms, e. g. the plural of nouns like arms, colours, loses its grammatical meaning and becomes isolated from the paradigm of the words arm and colours. As the result these word forms (arms, colours) develop a different lexical meaning (( arms = weapons and colours = flag) and become independent words. 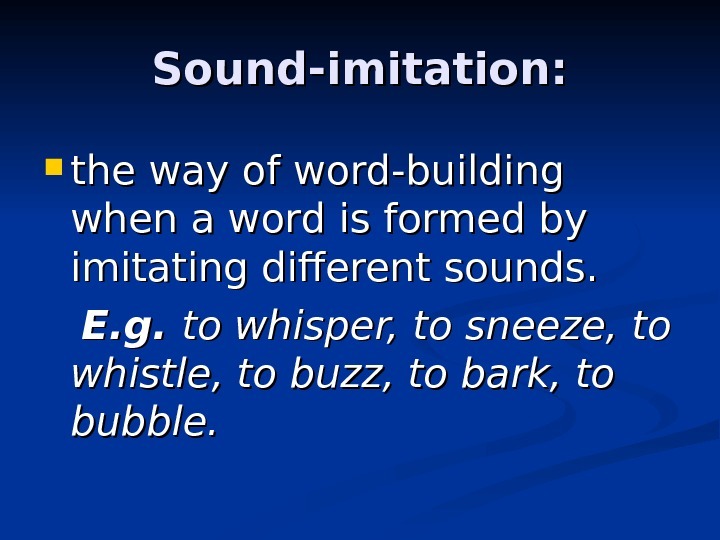 Sound-imitation: the way of word-building when a word is formed by imitating different sounds. E. g. to whisper, to sneeze, to whistle, to buzz, to bark, to bubble. 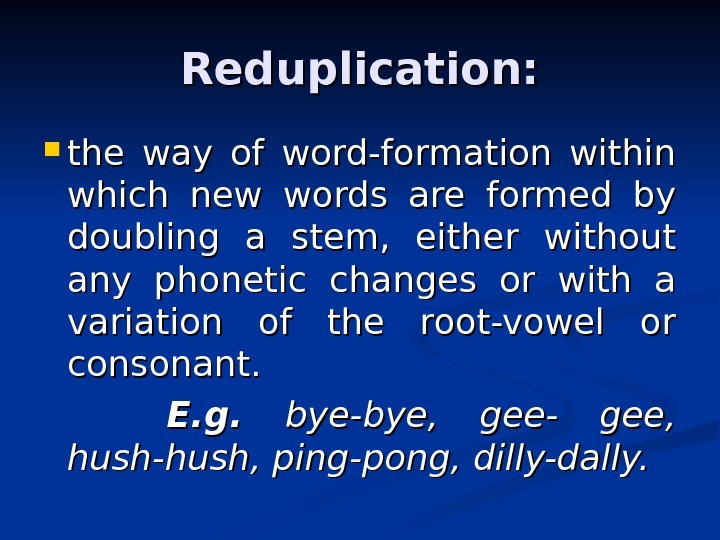 Reduplication: the way of word-formation within which new words are formed by doubling a stem, either without any phonetic changes or with a variation of the root-vowel or consonant. E. g. bye-bye, gee- gee, hush-hush, ping-pong, dilly-dally. 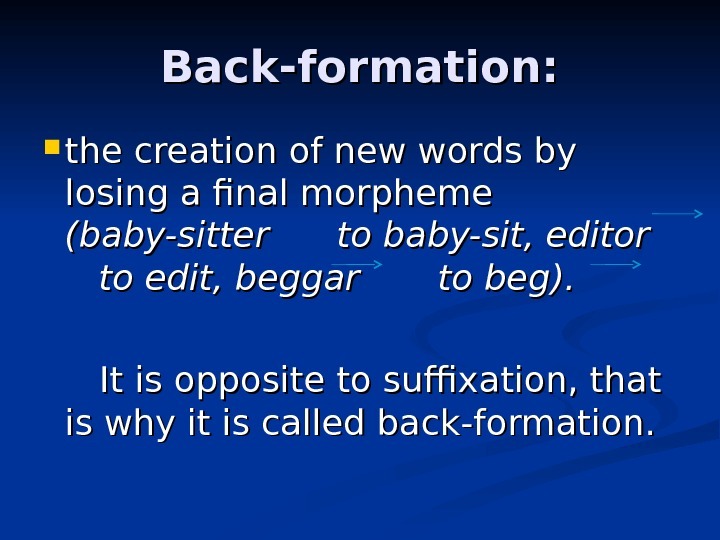 Back-formation: the creation of new words by losing a final morpheme (baby-sitter to baby-sit, editor to edit, beggar to beg). 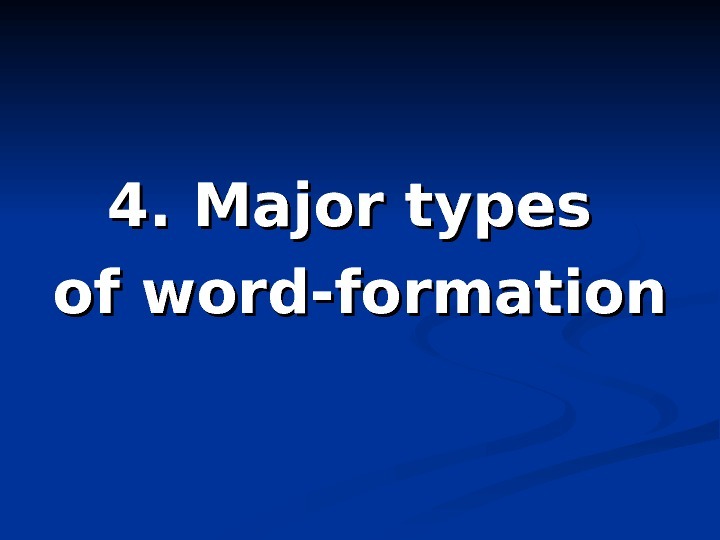 It is opposite to suffixation, that is why it is called back-formation. 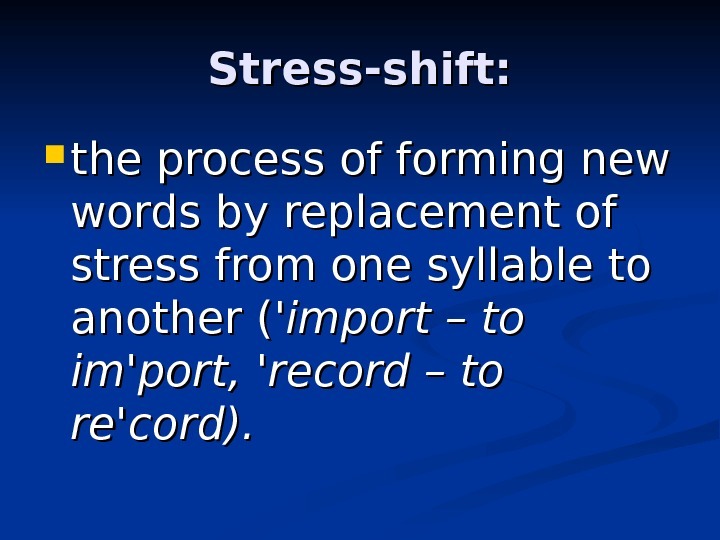 Stress-shift: the process of forming new words by replacement of stress from one syllable to another ( ‘import – to im’port, ‘record – to re’cord). 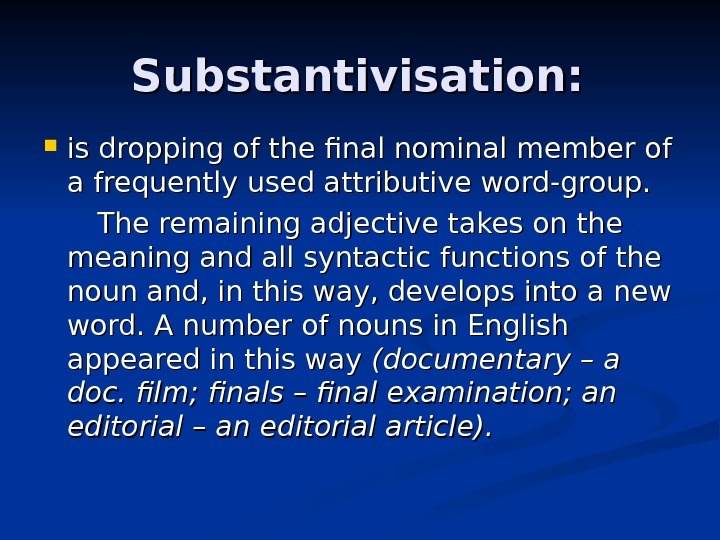 Substantivisation: is dropping of the final nominal member of a frequently used attributive word-group. The remaining adjective takes on the meaning and all syntactic functions of the noun and, in this way, develops into a new word. A number of nouns in English appeared in this way (documentary – a doc. film; finals – final examination; an editorial – an editorial article). 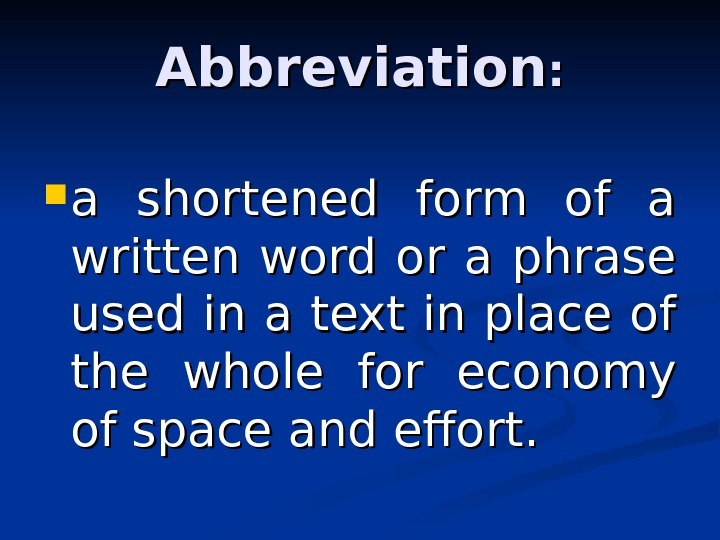 Abbreviation : : a shortened form of a written word or a phrase used in a text in place of the whole for economy of space and effort. 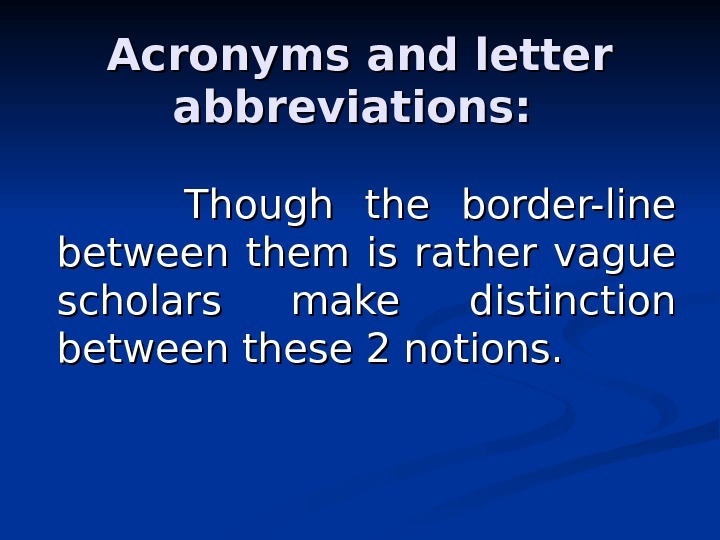 Acronyms and letter abbreviations: Though the border-line between them is rather vague scholars make distinction between these 2 notions. 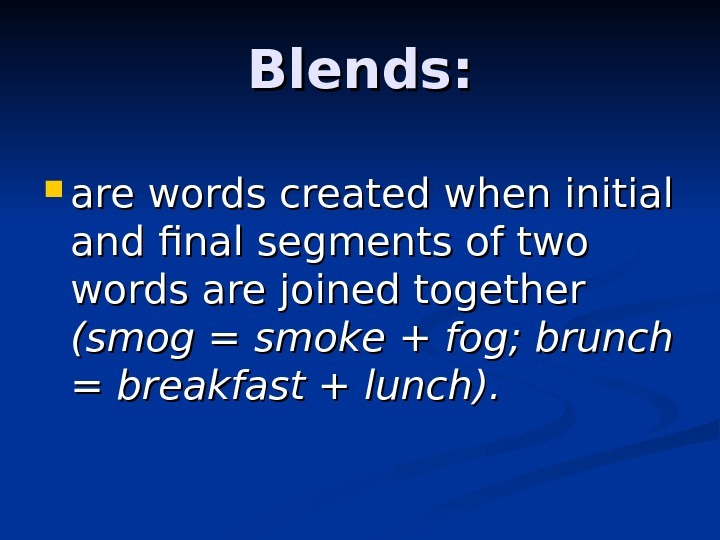 Blends: are words created when initial and final segments of two words are joined together (smog = smoke + fog; brunch = = breakfast + lunch). 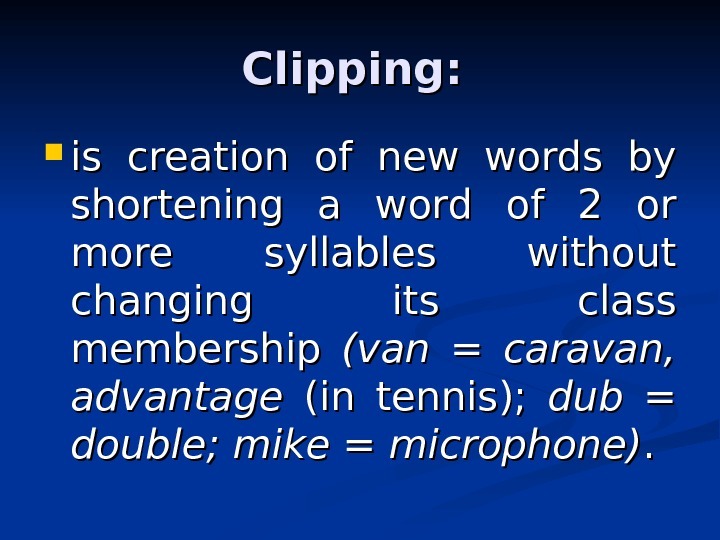 Clipping: is creation of new words by shortening a word of 2 or more syllables without changing its class membership (van = caravan, advantage (in tennis); dub = double; mike = microphone). .
As a rule, lexical meanings of the clipped and the original word do not coincide. 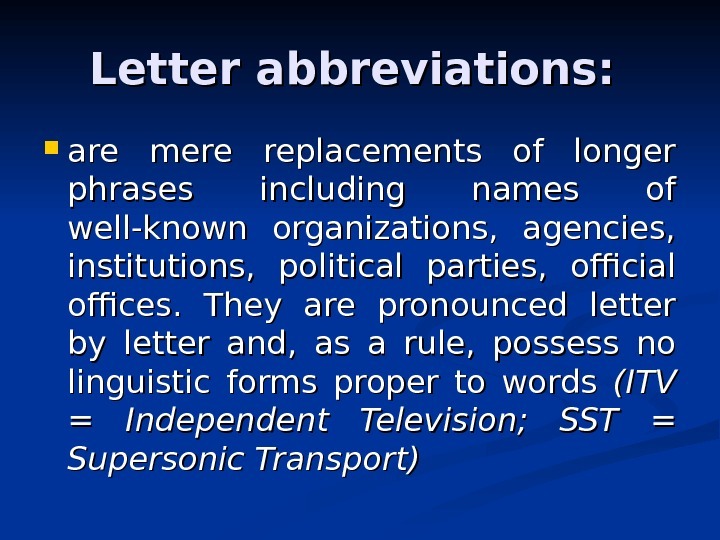 E. g. : Doc refers only to «sb. 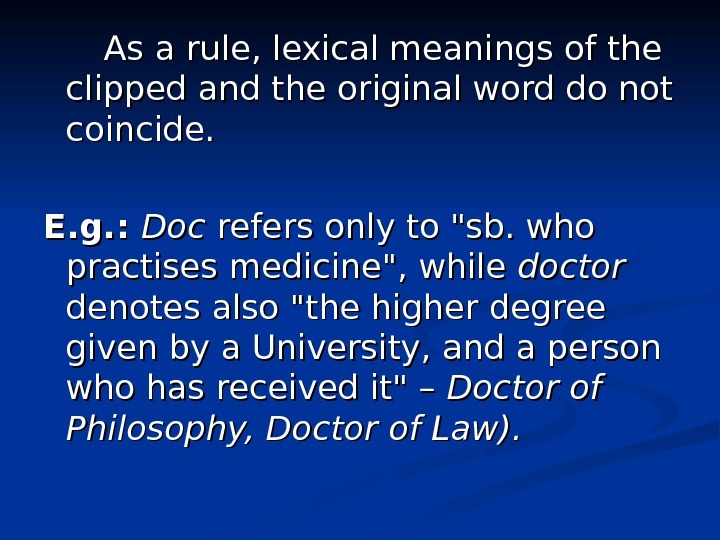 who practises medicine», while doctor denotes also «the higher degree given by a University, and a person who has received it» – Doctor of Philosophy, Doctor of Law).